I made this recipe again and it’s just fantabulous! This entry was posted in Recipes on July 3, 2010 by Donna. This is what I am making for dinner: Easy Baked Chicken Parmesan. The one difference from the recipe is my chicken breasts aren’t halved. Which makes me wonder how much longer I should cook them for? The other difference is my breadcrumbs aren’t seasoned so I just seasoned them myself (Pepper, Italian Seasoning, Salt). I am hoping it comes out okay! This entry was posted in Recipes on February 13, 2010 by Donna. My mom made this and everyone loved it! Said it spoke to their souls. Will have to try it. To make: Place the beets, potatoes, carrot and celery in a large saucepan with the water and add plenty of salt and pepper. Bring to the boil then reduce to a simmer and cook until the vegetables are tender. Meanwhile, heat a frying pan over medium heat and add the butter. When butter has melted, add onion and green pepper and cook until soft. Add garlic and cook until fragrant, about 1-2 minutes. Add to the soup pan with the tomato juice and return to a simmer. Add cabbage and red kidney beans and cook until cabbage is barely tender, about 5 minutes. Add vinegar and sugar. Taste and adjust seasoning if necessary. Serve each bowl hot, with a dollop of sour cream. This entry was posted in Recipes on January 31, 2010 by Donna. One of my favorite things to make anymore is Italian Sausage and Broccoli Rabe. It’s not hard at all to cook. I boil the Broccoli Rabe for 5 minutes and then blanch it for another 5-10 minutes. As it’s sitting in the cold water, I fry up the sausage with garlic (I like it crumbled rather than in links, sausage that is, not the garlic) and red pepper flakes. When the sausage is done I move it to a bowl and then sauté the Broccoli Rabe for about 5 minutes. Once the Broccoli Rabe is almost done, I throw in the sausage and mix them up together and sauté just a little bit longer to mix the flavors. At this point you can serve it as is or mix it in with pasta. Last night I did something new. I bought a can of the Pillsbury Pizza thin crust pizza dough and placed it in my iron skillet and cooked it in the oven for 5 minutes at 400 degrees. After 5 minutes, I took it out and spread some canned Pizza sauce on the dough. I then heaped it with the Broccoli Rabe and Italian sausage, sprinkled some fried diced green peppers and shredded mozzarella cheese on it and cooked it for another 15 minutes. CAN YOU SAY HOLY MOLY, GOOD!?! This entry was posted in Recipes on January 11, 2010 by Donna. 1 lb. of Spicy Italian Sausage from Home | DCWCasings either in patty form or if in a link, rip off the skin and crumble it. 1. Boil Broccoli Rabe for 10 minutes. Rinse (but save some of the water). Place in bowl full of cold water for about 5 minutes. 1. Saute sausage in oil along with the chopped garlic, till no longer pink. I chop at the sausage with my spatula so it’s all crumbly. 2. Add in about a 1/2 cup of the broccoli rabe water and 1/2 cup of chicken stock. 3. Add cooked beans, and cooked broccoli rabe. 4. Cook pasta and toss in. 5. Season with salt, pepper, and the grated romano, and maybe a little extra olive oil. The picture of the dish on the Proud Italian Website doesn’t look anything like the actual dish as I make it. Because I really cook down the broccoli rabe, there’s an almost pesto-quality to it. I serve it with Italian Bread. It’s delish. Give it a go and report back! Oh, and it tastes better the next day when eaten for lunch. This entry was posted in Recipes on December 7, 2009 by Donna. One of my Facebook friends (Tom Woods) recommended this recipe. He said it was easy and delicious. OH MY GOSH HOW RIGHT HE WAS! I love recipes that have limited ingredients! Give this a go, people! You will be glad you did! NOTE: You may need to get a deep dish pie crust because the regular one I used left me with excess. So I heated it up a couple days later, stirred in some rice and VOILA! Fantastic leftovers! This entry was posted in Recipes and tagged chicken pot pie, Easy, Recipe on November 30, 2009 by Donna. My mom found this recipe in the Parade magazine. These little coconut cakes are delicious- they taste like macaroons. LOVE THEM! And they are really easy to make. 1. Whisk the egg whites until they are smooth and a little foamy, then add the remaining ingredients one by one. Be especially light-handed when you stir in the butter and flour. 2. 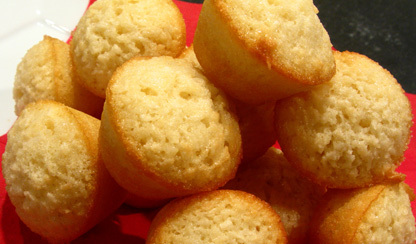 Butter two 12-cup mini-muffin pans or fit them with paper liners. Divide the batter among 20 of the cups and bake in a 350ºF oven for 17 to 20 minutes. The coconut cakes should be puffy, springy to the touch, and easy to pull away from the sides of the pans. 3. Remove the cakes from the pans immediately. If they’re reluctant to come out, rap the pans against the counter. Cool to room temperature before serving with coffee, tea, or even a little jam. Makes 20. Per cake: 110 calories, 12g carbs, 1g protein, 10mg cholesterol, and 6g fat. This entry was posted in Recipes on October 16, 2009 by Donna. Had a really nice dinner with my dad tonight. It’s one of my favorites. Always hits the spot. This entry was posted in Blah Blah Blah, Recipes on February 5, 2009 by Donna.